A guy asked me if I could make an application which allows you to turn on or off USB mounting. 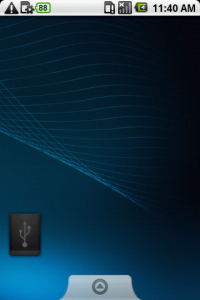 It is pretty annoying if you have plugged your phone to USB and it is not mounted automatically. Or if you have to unplug your device just to access the SD card from your phone. So, now you can simple click the MountUSB icon on your desktop to mount/unmount your SD card, which is much easiear than pulling the notification bar down and answering the AlertDialog if you want to mount or not. Beside that, there is still no solution to unmount, apart from unplugging the cable, which I suppose is not the best solution for keeping your battery long time alive.